The Standard colour is Black. We try to have these in stock at all times. Should you order one and it is not in stock we shall contact you immediately with the available options. 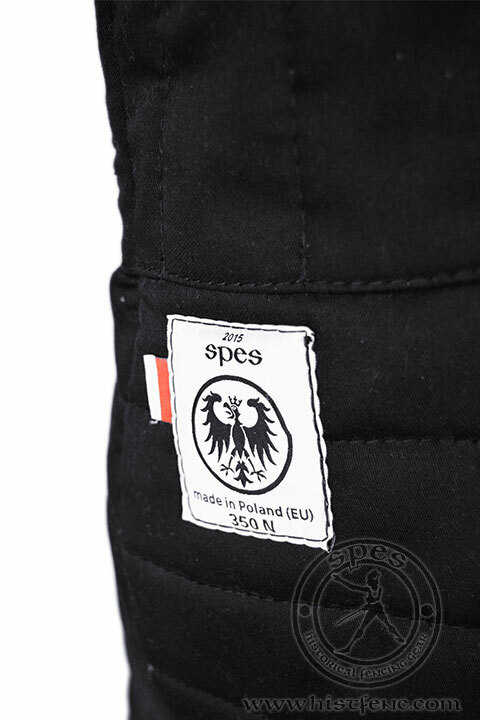 This gambeson was designed for the Polish HEMA groups of ARMA PL, and FEDER. It gives the best protection with the most amount of mobility. The gambeson is designed to protect from cuts and thrusts; with overlapping material at the torso and the neck. It is tailored so that the gambeson sits comfortably at the hips. The sleeves are constructed in two-pieces to allow for the best possible elbow mobility. There are deep-set sleeves and gussets in the armpits to allow for shoulder mobility. The gambeson has 3 protective layers on the shoulders, and 2 protective layers across the chest. To close the gambeson there are 12 leather straps and 6 leather bindings. This model was made with cooperation with "Fechtschule Gdansk" and Jan Chodkiewicz. The fabrics have been certified 350N puncture resistance. The construction of the jacket was strengthened. Custom sizing: Please write measurments in the"Customer opinion" space available in your cart before placing the order. For more information please read this. Well, I have had this gambeson for 3 months now and I must say I have not been let down. When I first received the gambeson I tied the leather ties that come with it and one broke. That was to be expected however. I have helped my father work with leather products since I was young and I know that the tensile strength for a cord of leather is not sufficient. The over all protection from the gambeson is excellent. I have yet to receive a bruise on the parts of my body where the gambeson protects, do however, expect to feel lumps where a solid blow connected. The trick is (what we should all be striving for) is not to get hit. I have received compliments everywhere I go while wearing this product. The ability to move and to come into correct form is simply amazing. all in all I would buy this product again, you won't be let down. 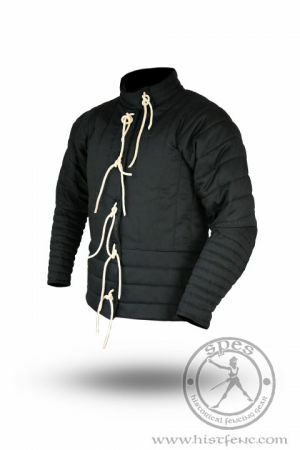 This gambeson is an excellent choice for those that want a historical style fencing jacket that could do both an SCA type event or a HEMA competition. It is very thick, thicker than most any others that I have come across in the 2 months I have been involved in historical fencing. Protection is great althouch common sense would dictate adding some plastic forearms for heavier sparring. It is quite warm, but in the fall/ winter months that is not all bad. Size large fit me very well at 5'10 43 to 44" inch chest. I would say that your abdomen should likely be smaller than your chest for this one as it is nice and snug. The leather ties are no issues and look cool to me, plus I cant stand the of center zip of some fencing jackets I looked at. They are easy to replace as well with paracord or whatever should one break. Mobility is excellent but this is not a garment to pile metal plate on top of due to its thickness. Overall great product with fast shipping and great service, can't go wrong.